How and What to Sell at Flea Markets and Garage Sales 4.25 out of 5 based on 12 ratings. 12 user reviews. So you’ve made up your mind: next weekend you will be selling at a flea market / swap meet / garage sale! 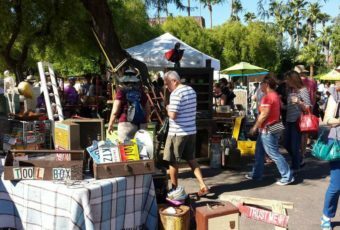 Besides being an opportunity to get rid of items you no longer use while making a few extra bucks, swap meets truly are a fun way to spend a day or two. They bring the community together during a couple of festive days, and are the occasion to see new faces and train your haggling skills! However, crossing from the seller side to the merchant side can seem daunting at first. But there’s absolutely nothing to worry about! Selling at flea markets is really fun, at least 80% of the time. We got you covered with a few basic tips for beginners, so you can put the odds in your favor at the next flea market sale! 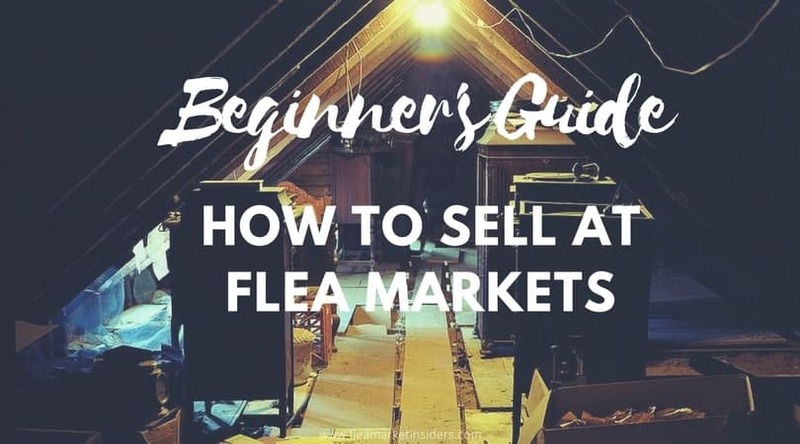 Our guide covers questions such as what to sell at flea markets and garage sales and shows you step by how to prepare for selling at flea markets. Participating in a garage sale, swap meet or flea market as a vendor, is not something you do on a whim. It requires a little bit of time to collect the things you want to sell, and a tiny bit of planning too – like getting in touch with the flea market organizers, making some change at the bank and setting up your itinerary). But nothing too complicated! What to sell at flea markets? First, you will need the obvious: items you can sell (or get rid of). 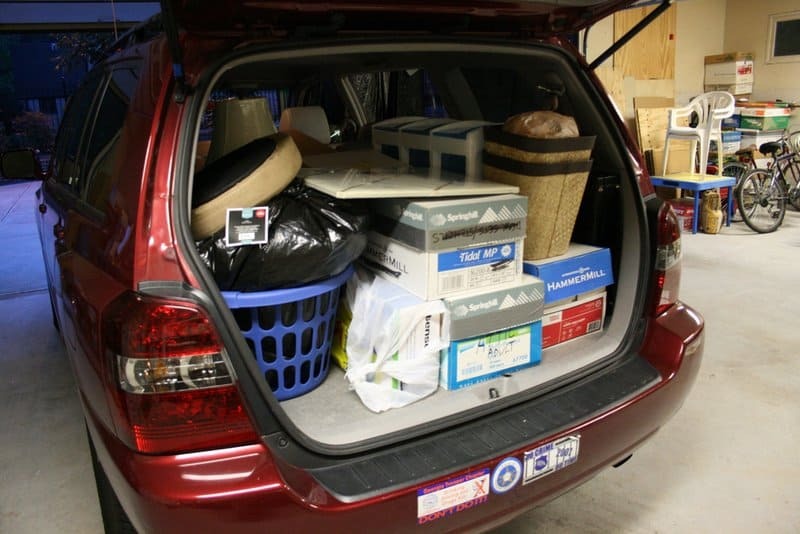 A garage sale is a great place to sell all the objects, clothes and junk that clutter your home. 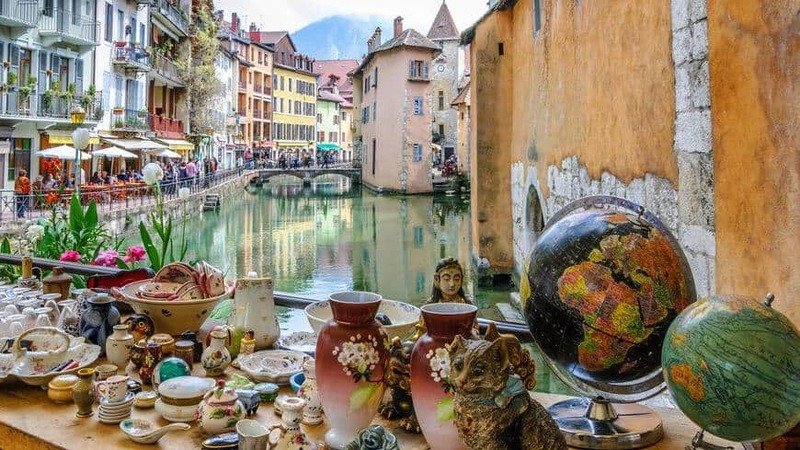 What to sell at flea markets and garage sales depends of course mainly on the items you already have at home – so start your search for the best flea market items to sell there! The cellar is a good place to start with: old bikes, wheelbarrow, garden tools, helmets, skateboard, radiator, tires and rims always find buyers. 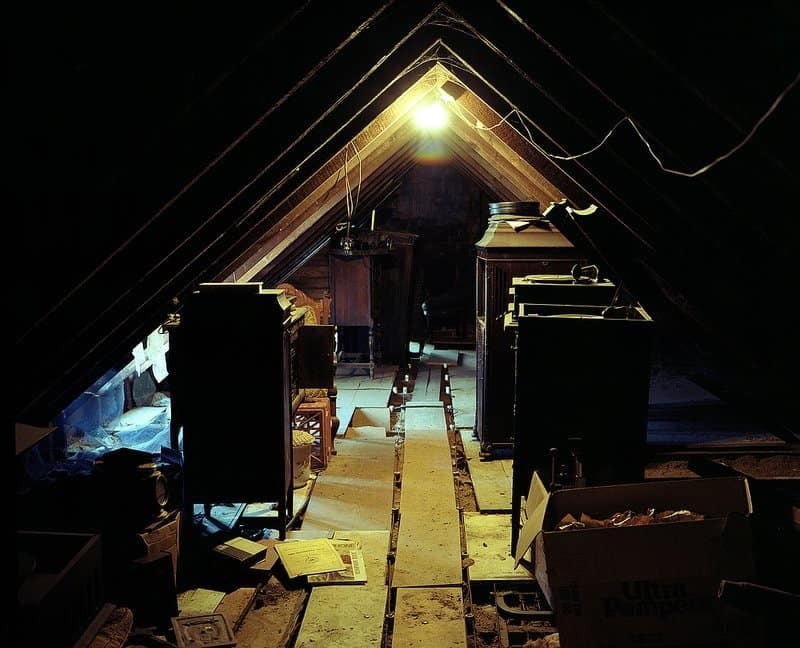 Then search the attic: generally more interesting than the cellar (attics are better ventilated, which is great to keep things in good conditions), it often harbors forgotten treasures. 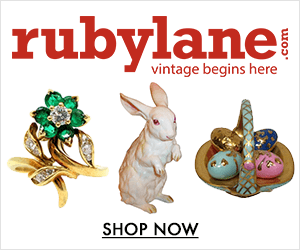 Old stamp collections, taxidermied animals, toys, postcards, coins, black & white pictures, vintage garments, militaria, books and clothes are some of the unsought treasure you can discover up there. But that’s not it: you can also gather a lot of unused stuff from the living room, bedrooms, kid room, and so on. A few weeks before the garage sale, put all those objects, clothes and accessories you do not like or use anymore aside, in a box. If those items are in a good condition and you think you can get a fair price for them, then try first to sell them online, on websites like Ebay, Depop, Shpock or VarageSale. Then put all the unsold items in a box you will keep for the garage sale day. Experience shows that some products sell significantly better than others. 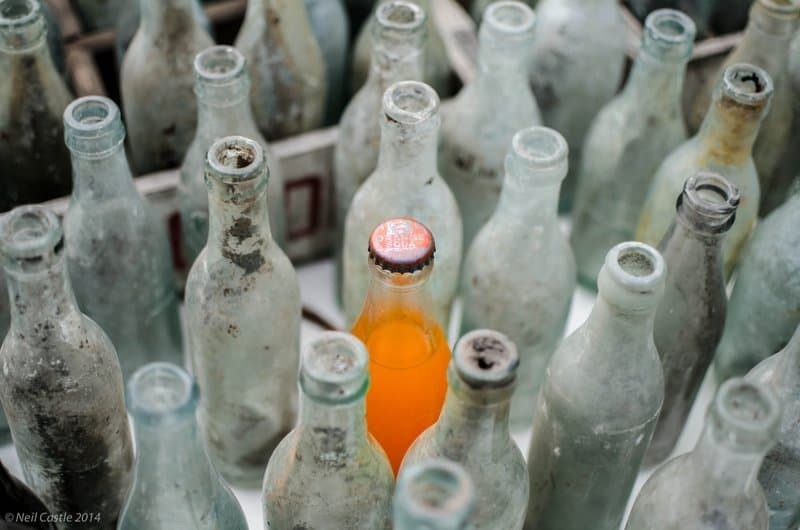 Here’s a quick overview of popular flea market items you’ll likely sell easily and those that you’d better write off from the beginning. Antiques, electronics and home appliance are among the best items to sell at flea markets and garage sales. 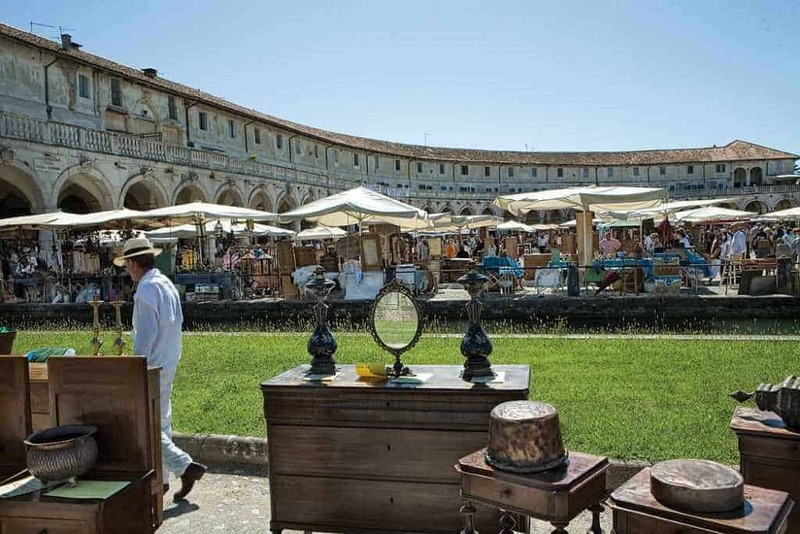 Antique dealers and other enthusiasts are aware of that and are among the first to show up in the morning to look for the most interesting items. Do not sell off these items too fast, as professional dealers will try to bring the price down anyway. Baby/toddler clothing & toys, as well as vintage and designer clothes, sell very well. Mobile phones are also popular, just like computers, game consoles (1980s, 1990s and 2000s vintage game consoles are well sought after nowadays) and video games. So don’t be afraid to stick to the price you set from the beginning since you will likely sell your stuff anyway. Books and magazines are among the items that don’t sell well at a garage sale unless you possess rare copies sought by collectors. If you simply want to get rid of comic books or paperbacks, you’ll do well by selling them off, as you will increase your chances of making a sale. Adult clothes also do not always find buyers. To sell them more easily, showcase them on a garment rack (ideally sorted by size) so bargain hunters can quickly find what they’re looking for. A mirror is also a nice plus, as potential buyers can try a garment on before buying it. Do not hesitate to offer a low price to attract more people. The day before the garage sale, everything should be packed and ready to be transferred to the event location. Getting ready for a garage sale is like organizing a move: you’ll have to pack the dishes in bubble wrap or newspaper to make sure they arrive in one piece at the event location, put the clothes in a suitcase and books & knickknacks in boxes. Do not forget other basics like a cup base, plastic bags, racks, tables, tablecloths, chairs and a tarp if it starts raining. If you sell clothes, try to borrow a garment rack. Also, ask a friend or a relative if he/she would like to go with you. Time flies when you can chat with someone, and you’ll also be able to get some assistance in case things get out of hand or if you need to leave the booth for a few minutes. Finally, don’t forget to pack some drinks & food to keep you alert the whole day, and protect yourself from the weather: hat, sunglasses, sunscreen, sweater, or a raincoat are often overlooked – but sorely necessary. Remember that at 5 a.m. you should not have to think about anything else than grabbing a coffee and driving safely to the venue of the event. Remember the saying “the early bird gets the worm”. Well, this works both for shoppers and vendors. The day of the event, it is important to be on site two hours before the public opening – usually sometime between 5:30 a.m. and 7 a.m.: setting up your stall early at the flea market, swap meet or garage sale will increase the probability of making interesting sales. 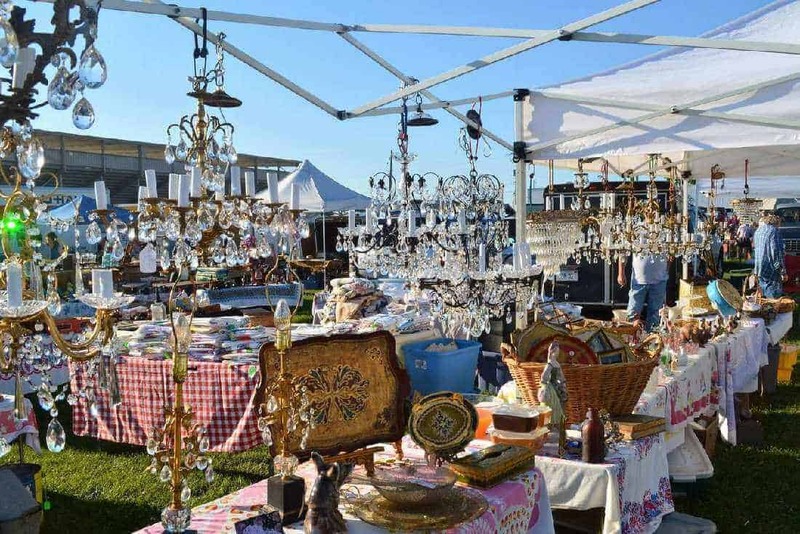 As a matter of fact, professional antique dealers and flea market enthusiasts are early birds, whether they like it or not, and usually show up before everyone else, when it’s still dark. You will see them with a flashlight in hand, rummaging through unpacked boxes and bags. When it comes to organizing your stall, remember to emphasize your most valuable and eye-catching items. If you use a regular board and trestles (a folding table with a carrying handle is, of course, a bit more practical) you should add a clean tablecloth to make your booth look more professional. Then, try to organize your items by topics: crockery on one side (usually at the back), antique, jewelry and valuable always at the reach of your hand (in addition, you can use a jewelry display stand on the table to improve the visibility of some of your smaller items), postcards and pictures in a shoe box, random items in the middle. Books and magazines can be placed in a cardboard box on the floor in front of your booth. Put clothes on hangers or garment racks to make them visible from a distance and stand out in the crowd. It will also make people’s life easier if you group garments by size. Keep in mind that it’s easier to sell seasonal clothing. Books and magazines can be placed in a cardboard box on the floor in front of your booth. Tip: Avoid featuring objects which are too shabby, or you might end up giving a bad image of your entire stall. Price tags: a good strategy or not? Whether you choose to display the price of each item, is of course up to you. Some merchants prefer to rather not put a price tag on the items they sell because they fear this could scare potential buyers from stopping by to negotiate. After all, much of the fun of garage sales is about haggling, isn’t it? Others make prices visible because, by experience, many people do not dare ask the price (or don’t want to bother asking) and just walk by. However, even in case you choose not to display price tags, you will still have to think in advance about the price of each item. One good rule of thumb is to start at +20/+30% of the object value and haggle down. When the end of the event is looming, do not hesitate to cut your prices in half: trust us, you don’t want to bring all that stuff back home, particularly if it’s furniture. Write the price on a sign (the bigger, the better) and wait for last minute customers. Early bird are those who usually find hidden gems, while “late birds” are those who generally get the best bargains. Tip #1: do not set too high prices. At a garage sale, shoppers expect to find cheap items. If you have a doubt about the rate you should set, look around to see what prices other merchants charge for similar items, and readjust your own. Tip#2: offer items with a discount. Instead of haggling down the price of an object, you can offer your customer a second item for half the price or even for free! That way, you kill two birds with one stone: keep a good margin, and unclutter your home. Garage Sales: a full income or just some petty cash? Unless you’re selling exceptional items on a very regular basis (spending weekends selling at flea markets + weekdays selling online), you won’t be able to rely solely on garage sales to make a second income. 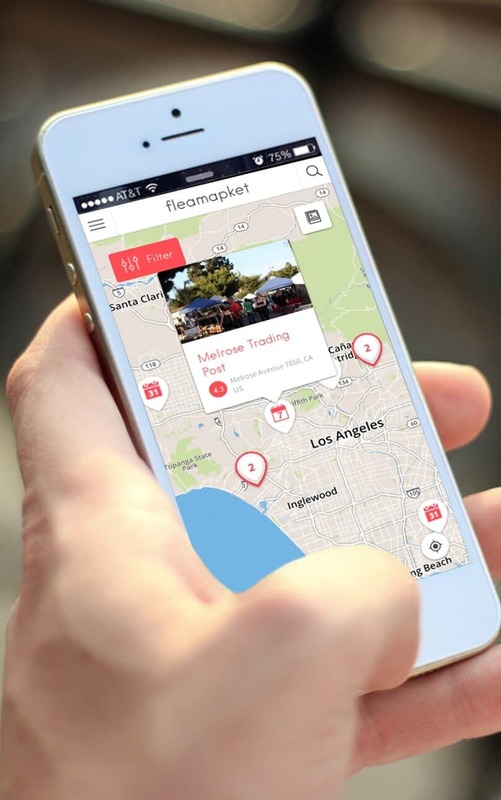 On average, non-professional flea market sellers earn between $80 and $180 a day. But this requires some flexibility, haggling technique and… good weather: rainy days are usually terrible for business unless the garage sale takes place in a covered area. Anyway, remember that adding a few extra bucks to your regular paycheck is only a small share of the fun of selling at flea markets. Flea markets are a good side hustle but, first and foremost, they are a lot of fun! What we personally love about selling stuff at flea markets is that they are an easy way to get rid of all the stuff that clutters our home. 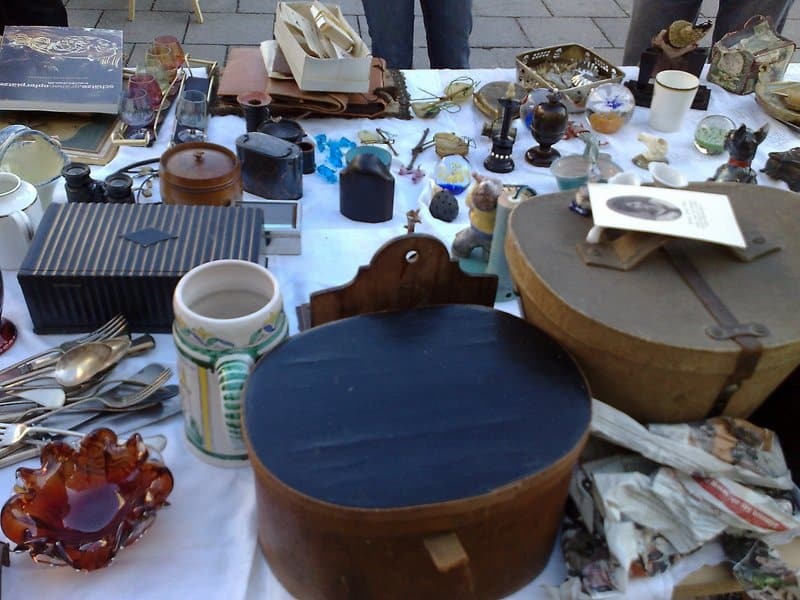 But selling at flea markets is also a good opportunity to have a look at what other merchants sell (and buy from them! ), reward our self with junk food and just have a great time with the rest of the community! If you like garage sales and flea market sales so much that you can actually picture yourself doing this full time, you should know that one step at a time, one weekend after the other, you will eventually gain enough expertise to turn this passion into a full-time job. It is all a matter of willpower and resilience! That’s actually how most antiques dealers and flea market merchants, started! So, why not you?